I really like a good dinner party, either hosting it or being a guest. Hosting it is fun because you can plan out the menu (something that I really enjoy), set a beautiful table, mix a special welcome drink and being a girl, find a pretty dress and do my hair. And luckily for me, I have a boyfriend who also really enjoys hosting a dinner party, so we have people over for dinner, more or less fancy every now and then. But I really like to be a guest as well. To just relax, find a pretty dress, a cute hostess gift and enjoy an evening out with great friends. We had one of those evenings a few weeks ago with amazing food (the host is a professional chef, score!) good friends and as always- wonderful wine and lots of laughs. I was asked to bring cupcakes for dessert. 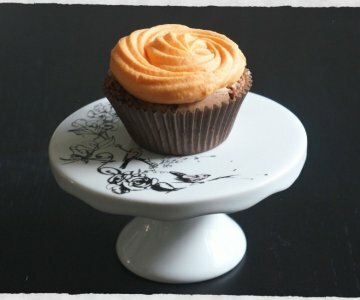 I made combination of two parts I have made often but never together: vanilla cupcakes ad cocoa cream cheese frosting. 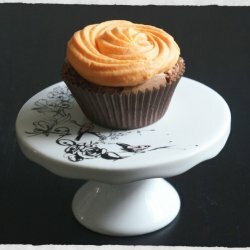 I usually make this frosting with brownies or banana bread, but I think that it works great with these light and fluffy vanilla cupcakes. Beat together the icing sugar, butter and cocoa powder in an electric mixer with a paddle attachment (or use a handheld electric whisk) on medium-slow speed until the mixture comes together and is well mixed. Add the cream cheese in one go and beat until it is completely incorporated. Turn the mixer up to medium-high speed. Continue beating until the frosting is light and fluffy, at least 5 minutes. Do not overbeat, as it can quickly become runny. Decorate and enjoy your cupcakes.